금동약사여래입상(金銅藥師如來立像)는 국립중앙박물관에 있는 높이 29㎝의 자그마한 금동불로, 광배(光背)와 대좌(臺座)는 없어졌지만 비교적 잘 보존된 약사여래입상이다. 약사여래는 모든 중생의 질병을 구제해준다는 의미를 지닌 부처로 손에 약합을 들고 있는 특징이 있다. 머리에는 작은 소라 모양의 머리칼을 붙여 놓았고 그 위로 상투 모양의 머리(육계)가 큼직하게 솟아 있다. 풍만한 얼굴은 미소없이 근엄한 인상이며 눈· 코·입의 선이 명확하고 치밀하여 세련된 조각미가 느껴진다. 두 귀는 어깨에 닿을 듯 길게 표현되었고, 목에는 3줄의 주름인 삼도(三道)가 뚜렷하다. 옷은 양 어깨에 걸쳐 입고 있는데, 지그재그형 옷주름과 U자형 옷주름이 표현되어 있다. 당당하고 건장한 신체는 두껍게 축 늘어진 옷으로 인해 다소 둔중해진 듯 하다. 오른손은 허리 아래로 내려 엄지와 가운데 손가락를 맞대고 있고, 왼손에는 약항아리를 들고 있다. 대좌는 없지만 불상을 대좌에 꽂았던 뾰족한 촉이 두 발 밑에 하나씩 남아 있으며, 불상 뒷면에는 주조할 때 뚫은 구멍 자국이 남아 있다. 높다란 머리묶음과 얼굴 표정 등이 백률사 금동약사여래입상(국보 제28호)과 비슷하여 8세기 전후에 만들어진 작품으로 추정된다. 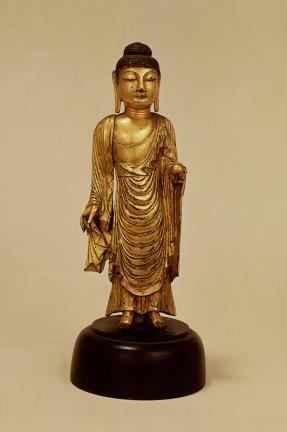 This is a small gilt-bronze statue, 29 centimeters high, preserved in the National Museum of Korea. The mandorla (Buddhist halo of light) and pedestal are gone, but this standing gilt-bronze Bhaisajyaguru Buddha is in relatively good condition. The Bhaisajyaguru Buddha is the Buddha who saves humankind from all diseases, and it is always holding a medicine jar. The hair is done in a curly nabal style (i.e. twirled up and around in a seashell-shaped fashion) and usnisa (a protuberance symbolizing supreme wisdom), shaped like a topknot, is large and tall. The plump face is not smiling but serious. The eyes, nose, and mouth are clear and cleverly sculpted. The ears are long enough to almost reach the shoulders and samdo, i.e. the three wrinkles on the neck are apparent. The right hand is held beneath the waist, with the thumb touching the middle finger. The left hand is holding a medicine jar, which is characteristic for a Bhaisajyaguru Buddha. The beobui (sacerdotal robe) covers both shoulders, with zigzagging and 'U' shaped folds on the front. This heavily sagging robe seems to weaken the impression of the dignified and healthy body. Although the pedestal is missing, two sharp points of stakes that had been attached to it remain beneath the feet. There are holes in the back of the statue that were used in its casting. The tall usnisa and the facial expression are similar to those of the Standing Gilt-bronze Bhaisajyaguru Buddha of Baeknyulsa Temple (National Treasure No. 28). That is why this statue is believed to have been made about the eighth century.